Apantac is a leading designer and developer of high quality and cost effective multiviewers, video walls, matrices, extenders, openGear solutions and signal processing equipment. The Apantac product line has been specifically designed to provide users with flexible and innovative technology solutions for the broadcast and ProAV industries. An introduction to Apantac at IBC 2018 with InBroadcast. Thomas Tang, President at Apantac explains how 10 years ago it all started off in his basement now, Apantac's catalogue consists of 200 products. Addressing a key demand of the market to have more multiviewer heads or outputs in a single piece of hardware, the TX# brings to the market a truly modular approach offering flexibility as well as a high-quality visualization and monitoring solution for broadcast master control playout, command centres and other similar operation and situation centres. Apantac showcased and demonstrated their new TAHOMA UE Series of Multiviewers. The UE is an HDMI 2.0 Multiviewer for 4K/UHD visual monitoring environments. This new series accepts four (Model: UE-4) or eight (Model: UE-8) HDMI 2.0 inputs and HDMI 2.0, 12G SDI and down-converted 1080p SDI outputs. The UE series supports multiple VESA and CEA input resolutions up to 3840x2160p 60Hz (UHD) and 4096x2160p 60Hz (4K) and various output resolutions up to UHD/4K. The architecture is based on a 4x1 cascadable multiviewer, which allows facilities to increase the number of inputs to be monitored on a single display. 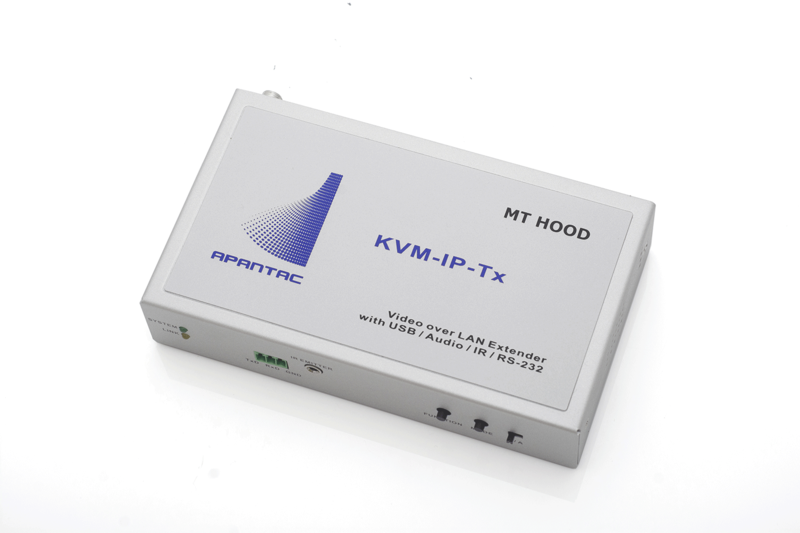 Apantcac have expanded their line of KVM over IP extenders and matrices. This second generation KVM over IP extender/receiver set (Models: KVM-IP-Tx/Rx) is ideal for applications where multiple local computers need to be accessed from multiple remote locations. Functioning as extenders/receivers, the KVM over IP solutions provides point-to-point extension of HDMI, DVI, or analog VGA over CATx. Posted in Apantac, IBC, Latest News and tagged #IBC2018, 4K, Broadcast, HDMI, IBC Show, KVM over IP, Modular Multiviewer, Multiviewers, Post IBC News, ProAV, Tahoma UE, TX #, UHD.